Changes have now been visible in many gullies on Mars, and they show that these landforms are evolving rapidly. The timing of the changes is often in winter or early spring, suggesting that they are caused by the carbon-dioxide frost that forms in and around most gullies every year. Another example is shown at PIA17958. The "before" image at left is a portion of May 30, 2007, HiRISE observation. The "after" image is part of a May 31, 2013, observation. Other image products from those observations are available at http://hirise.lpl.arizona.edu/ESP_032078_1420 and http://hirise.lpl.arizona.edu/ PSP_003939_1420. Note: This impact crater is located near the western end of Sirenum Fossae, southwest of Mariner Crater. 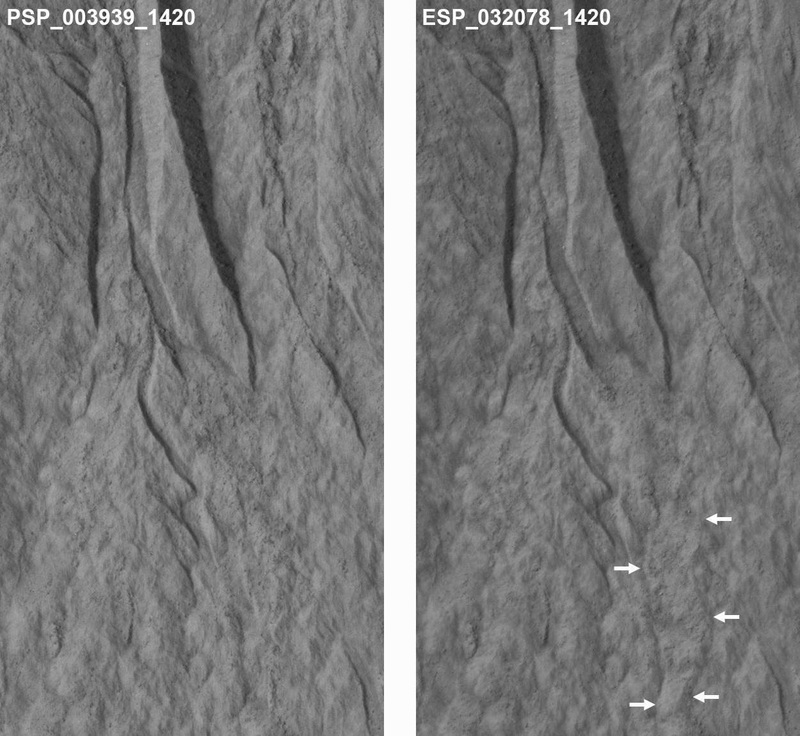 For more information, see NASA Spacecraft Observes Further Evidence of Dry Ice Gullies on Mars and PIA18538: Changes Near Downhill End of a Martian Gully.